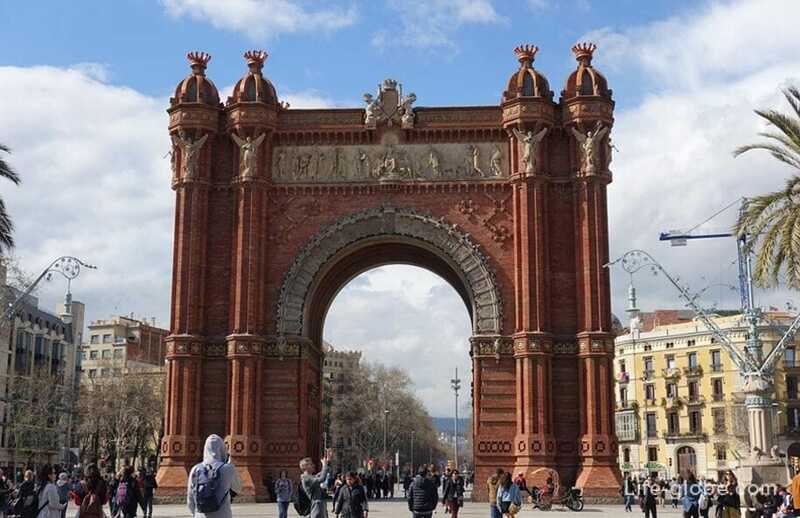 Triumphal arch in Barcelona (Arc de Triomf Barcelona) - one of the most famous monuments of Barcelona. Arc de Triomphe in Barcelona was built as the main entrance (main gate) of the world exhibition of 1888, held in the Park of the Citadel or Ciutadella. Since then, arch has become strongly associated with the architecture of the city and joined the list of sights of Barcelona. 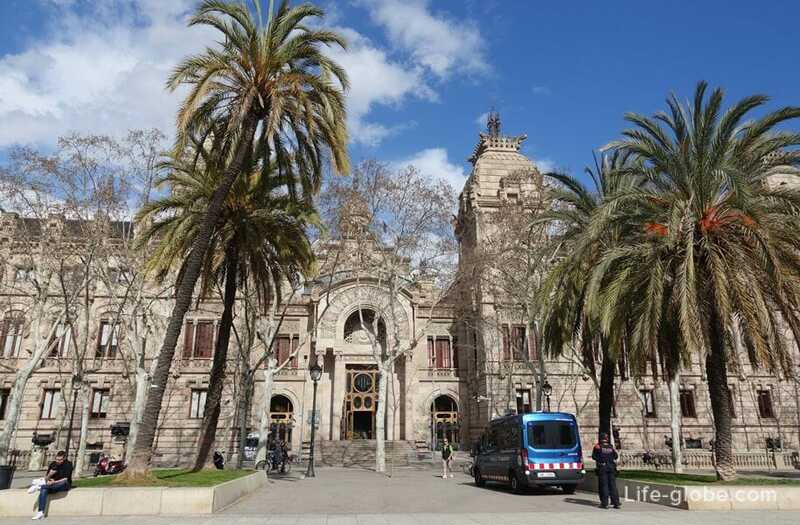 A monument to classical forms and proportions, but with a sculptural, decorative trim, torn apart and filled with symbolism, which is one of the icons of the city, in conjunction with the Boulevard and the monumental building of the Supreme court of Catalonia, created a magnificent ensemble of combinations of styles of architecture and nature, producing a lasting impression. 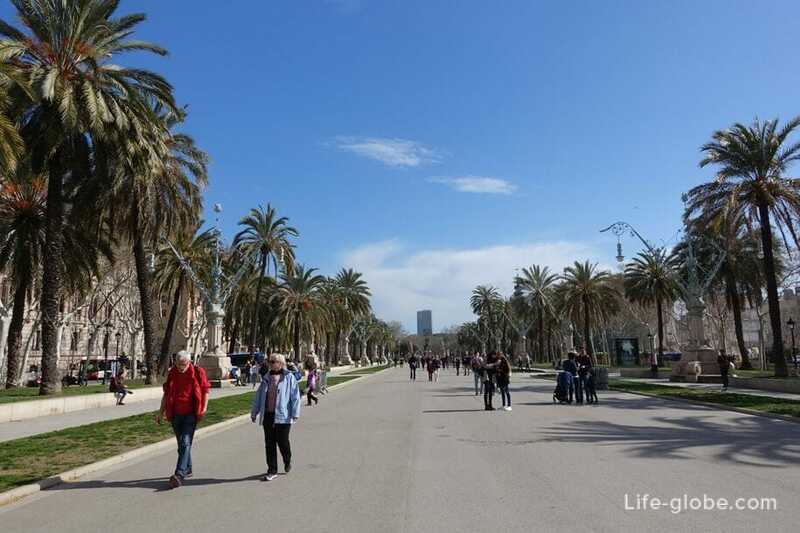 In the opposite direction from the Triumphal arch end of the Boulevard de Passeig de Lluís Companys, from the Park of the Citadel is an impressive monument to a former mayor of Barcelona Francesc Rius and Taulet (Estàtua de Francesc Rius i Taulet). 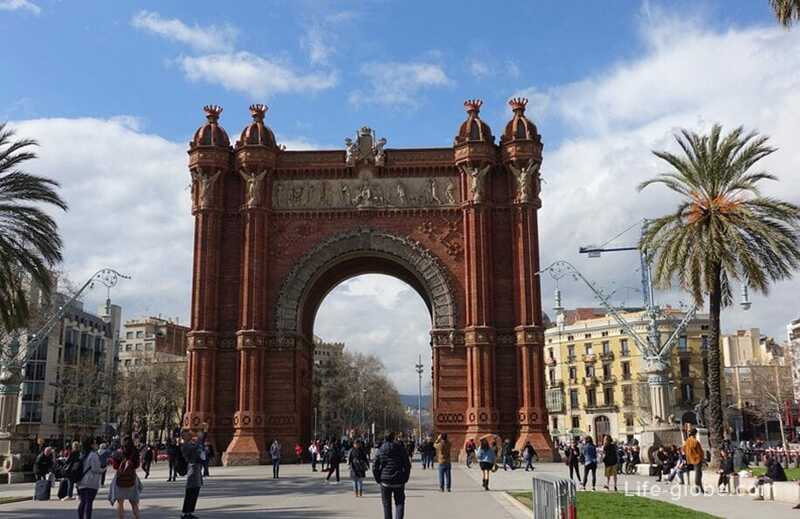 The arch was built by the architect Josep Vilaseca and Kasanovas (Josep Vilaseca i Casanovas). The arc has 30-metrou height. Its architectural appearance is of red brick with decorations on all sides with stone carvings and ceramic tiles. The style is Neo-Mudejar, with origins in Moorish architecture. The front frieze contains the stone sculpture Barcelona (Catalan for "Barcelona welcomes the nation") the works of Josep Reynes. The opposite frieze contains a stone carving entitled "Remuneration" ("Recompensa"), working from a very early period, Josep Limona representing the awarding of the world Expo. Friezes on the sides of the arch include allegories of agriculture and industry, the work of Antoni Vilanova - on the one hand and of Commerce and art, the work of Torquata Tasso - on the other. The two columns of the arc is of stone bats, which was the emblem of king Jaume I, who ruled in the period of prosperity of Barcelona. Arch the upper part decorated with the emblem of Barcelona and the arms of the 49 Spanish provinces on the facades. 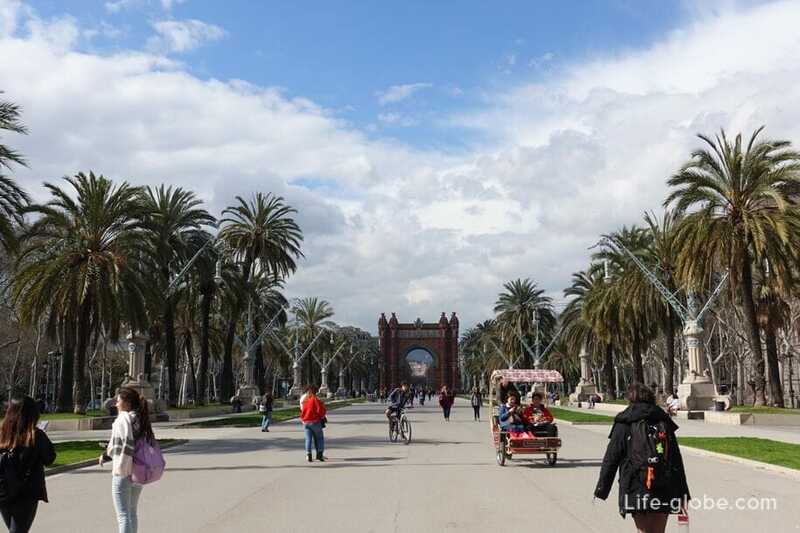 Arch is at the intersection of two boulevards of Barcelona - Passeig de Lluís Companys and Passeig de Sant Joan. Access to the arch clock. To get to the arc de Triomphe you can walk from the centre of Barcelona. 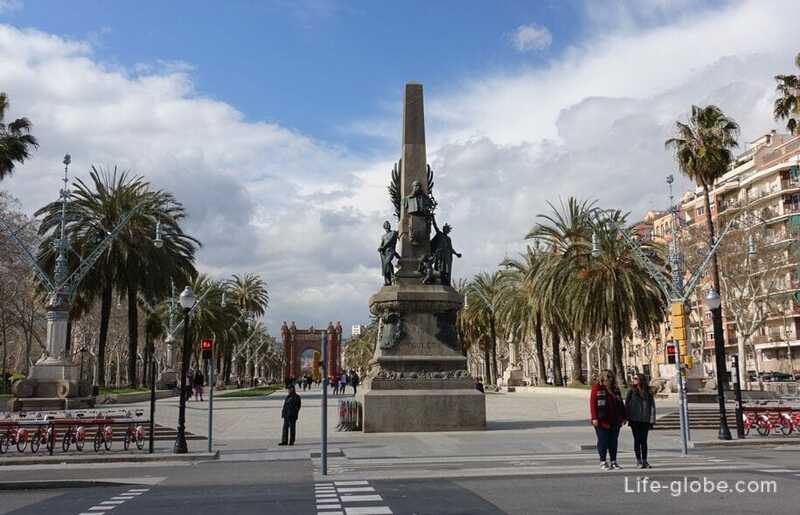 Distance from Plaza Catalunya square is 1.1 km away. Near the arch is a metro station "Arc de Triomf" line L1. Railway station trains R1, R3, R4, R7, R12, RG1. There are several bus stops. 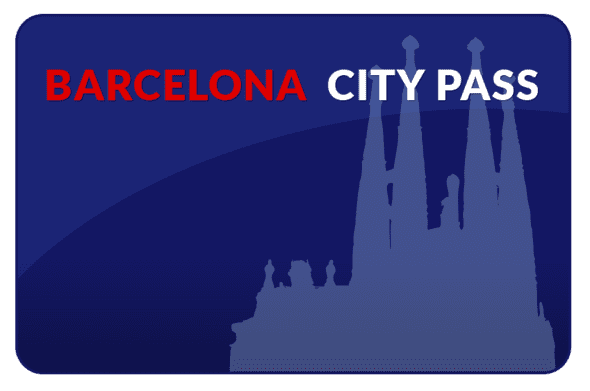 Visit the arc de Triomphe can be combined with a walk through the Ciutadella Park and Barcelona zoo, a visit to the excavations at the El Born Centre de Cultura i Memòria and walks through the streets of the Old town of Barcelona.